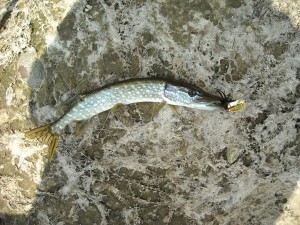 Another day of shore fishing at the Root River Parkway Pond. The weather changed and it was real windy. I did end up pulling this one out. 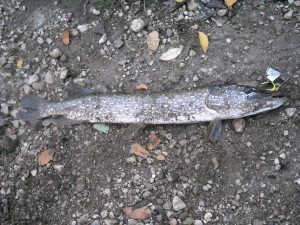 Maybe the same one that I caught before? Another day at the secret spot. 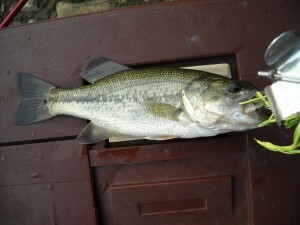 Caught a large mouth bass on a yellow-green top water spinner. Lost a nothern (and lost a black top water spinner) in the weeds. The line broke. It is a little funny, that when I started to fish there last week, a guy there said that supposedly there is large mouth bass in the pond, but he had not caught anything. When I was leaving, I saw a buck on the edge of the trail. If I would have been really prepared, I would have had the camera out ready to take a picture. This is a little bit out of the way to find it. 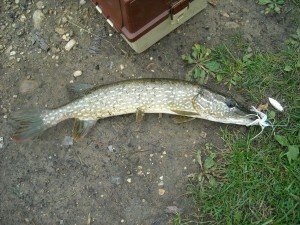 The pond really does not look like it is fished much, so I will be going there more often. 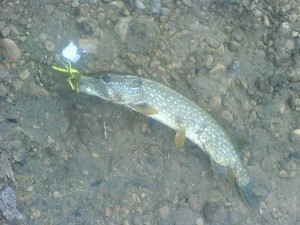 Anyway, a northern on a top water yellow spinner.